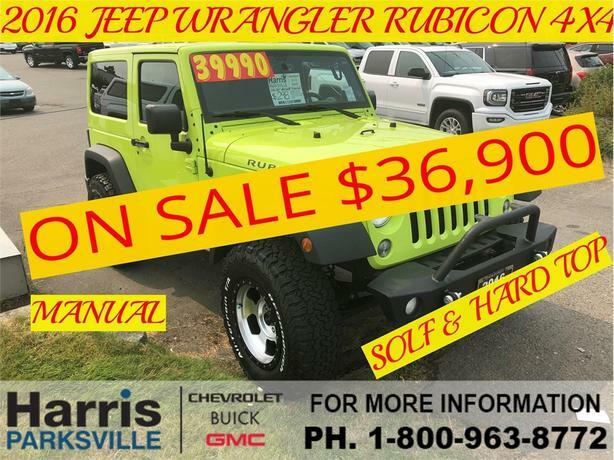 This Hypergreen coloured 2-door 4x4 Jeep Wrangler Rubicon was traded in for a 3/4 ton truck because the customer's needs changed. It has less than 18,000kms on it. It has aftermarket (American Racing) rims on LT285/70R17 BF Goodrich K0'2 All Terrain tires. But it also comes with the original Jeep rims and tires. This Jeep has the 3.6-litre Pentastar V6 engine and a 6-speed manual tranmission. Includes the 'Dual Top Group' of the removable hard top and a black soft top. Has a built-in GPS Navigation System, is Satellite radio equipped and so much more.